The site will exclusively produce both vehicles for Europe following investment of more than £240m in 2017 to enable production of vehicles using its new global Toyota New Global Architecture (TNGA) platform. The announcement comes just days after both Ford and Jaguar Land Rover confirmed plans to axe jobs. Ford’s redundancies are believed to be in the thousands while JLR said it was cutting around 4,500 jobs, starting in the UK, after being hit by economic uncertainty from Brexit and declining sales in China. However, the diesel downturn is also a key contributory factor. Toyota announced at last year’s Geneva Motor Show that it’s phasing out diesels from this year. 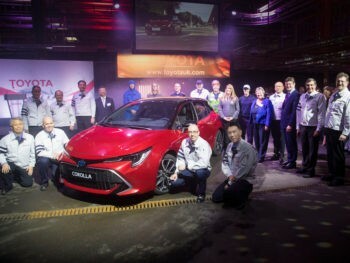 The 12th-generation Corolla – which ditches the Auris badge to return to the Corolla name still used elsewhere around the globe – will be the first Toyota model in Europe to offer a choice of two hybrid powertrains – an upgraded 1.8 litre engine that is manufactured at the Toyota Deeside engine plant in North Wales, and a new 2.0-litre unit plus a 1.2-litre turbo petrol – when the Corolla Hatchback and Touring Sports estate launch across Europe from February. These will be joined later this quarter by the saloon, which returns to the UK line-up after a break of nearly 15 years and is expected to use the same engine line-up. Speaking at a ceremony held today at the TMUK car plant at Burnaston, Dr Johan van Zyl, president and CEO of Toyota Motor Europe, said: “TMUK was our first major manufacturing enterprise in Europe and we have invested more than £2.75bn in its operations since the start of production in 1992. The ceremony was also attended by UK Secretary of State for Business, Energy and Industrial Strategy, Greg Clark who said: “Toyota’s decision to produce the new Corolla hybrid here in the UK is testament to our proud manufacturing heritage, the highly skilled workforce and leading innovation that sets our world-beating automotive industry apart.